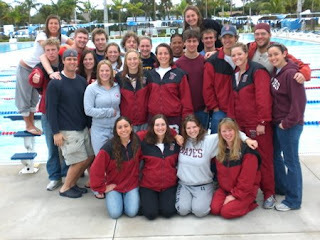 Eight student athletes from the Bates College Swimming and Diving team were named 2008 Winter All-Academic selections by the New England Small College Athletic Conference! To be eligible, a student must be a junior or senior, a varsity letter winner and carrying a cumulative grade point average of 3.35 or better. Congrats!! (Yeah, this team does it all... lifetime bests, breaking records, going to nationals... and all the while - fantastic grades!). It's what college swimming is all about!